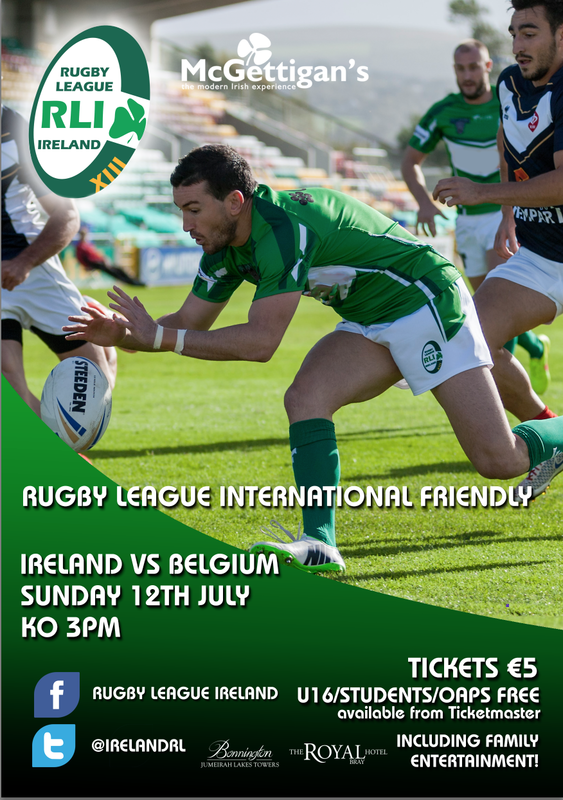 On the 12th of July in the Carlisle grounds in Bray, Co. Wicklow, Rugby League Ireland will host Belgium in a test match, boasting a completely domestic-based Irish team. This will be the first team of its kind and will be the first meeting of the two sides in International Rugby League. The Belgians, are coached by former Leigh, Oldham and Oxford boss Tony Benson who has been involved with Ireland previously and we look forward to welcoming him back to Ireland. The Irish team, sponsored by McGettigan’s, will be coached by Current Students head coach Carl de Chenu. De Chenu has a strong pedigree himself and has time and time again proved himself worthy with the Irish student team and has a lot of support stepping up to the senior level. The team will have a mix of players who have played at Ireland A level and players who will be getting their first taste of International rugby league. This match, the first of three will give all players involved a full international cap. The other two matches will be away, versus Serbia on August 29 and Malta on September 5. “These games will help develop our local players and prepare them to step up to the European Championship games in the autumn,” said Richard Egan, Director of RLI. Congrats to all winners you will be notified shortly about collecting your prize.